Custom POP displays are the silent salesmen that work round-the-clock to increase your revenue significantly and without any recurring costs. *Research shows that store sales can register as much as a 65% increase when quality point of purchase materials are used. All you need is an eye-catching exhibit that captures the attention of your customers. Avante POP Displays is an established manufacturer of Custom POP displays offering quality design, manufacturing and factory-direct purchasing with no start-up costs or developmental charges. Our attractive custom POP display materials can be seen in stores all across North America. Whether it is a floor unit, end cap or an attractive counter top exhibit, our award-winning in-house design team will create a stunning custom POP display that your customers simply can’t ignore. From giftware to home improvement and pet products, we have varied market experience. We love a challenge! Our custom POP display units have helped hundreds of marketers and retailers sell, sell, sell! Buy factory direct Point of Purchase displays from Avante POP Displays to reduce cost and enhance your bottom line. Call toll free 1-877-407-8655 or request a brochure to learn more about our outstanding Point of Purchase displays. Custom POP Displays: What You Need, When You Need It! Market *research reveals that custom POP display’s offer a 2:1 advantage over standard materials. An in-store analysis performed by PCi, found that custom POP displays delivered a 28% sales lift, while standard materials generated a 13% lift. These results were consistent across multiple materials and messages. 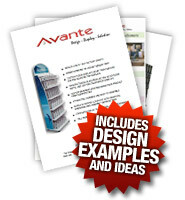 Avante POP Displays custom designs, manufactures and distributes Point of Sale displays direct from our factory. We have worked with many well-known companies including Dish Network, Molson’s Brewery, Maytag/Crosley Appliances, JVC Electronics, Watkins, Body Glove, National Geographic, LG and many others. Our team of creative designers will work with you to achieve an attractive point of purchase display with custom branding specific to your products and target audience. Call 1-877-407-8655, request a custom quote or download our brochure today for information about custom designed Point of Purchase displays.